For consultants, invoicing is a critical stage in the business process that ensures that income is received and managed efficiently. Invoices work both ways, creating a clear and correct certificate for the amount owed to you by the client, and gives the client a clear report that summarizes the services they are paying for. Thus, having a working invoice template is necessary. When creating a consultant invoice template Excel is usually preferred by most consultants. Capturing project details for the clients in the first tab of the workbook. The second tab can be used to track the payment status of invoices. 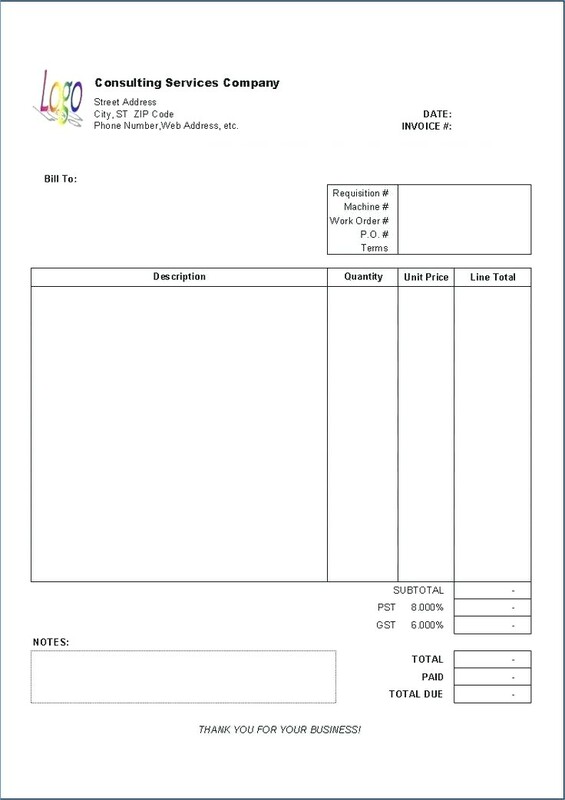 The other sheets of the workbook can be used to create the actual invoices that are sent to the clients. A single workbook can be used to monitor the billing status of businesses, coming in handy for reviewing the performance of your business. The beauty of a consultant invoice template Excel is that you can customize the look and feel of the invoices to reflect the image of the business. It is possible to outsource design work if you don't want to design the consultant invoice template from scratch. The resultant consultant invoice templates can be customized for individual clients afterward. Consultant invoice templates in excel use invoice numbers that move chronologically. The figures take precedence over alpha-numeric tags that would otherwise be confusing for bookkeeping. If the books get tangled at any point, you could end up double-billing the client for services offered once. The chances are that the client also uses a bookkeeping system that will notice this issue, making your consultancy seem disorganized. Unique invoice numbers will mitigate this possibility of double-billing. It is possible that there are changes to the initial task, especially after an invoice has been sent. A consultant invoice template Excel should allow for such a possibility. While some consultants would want to add to the invoice already submitted (thus editing the invoice), a new invoice number is recommended. A new unique invoice number allows these changes to be captured clearly. This way, you can continue to use the original consultant invoice template to invoice in stages or as agreed before the project. Using Excel for consultant invoicing makes use of a chronological arrangement of unique invoice numbers. Therefore, when receiving payments, you can track which payments have been received partially and in full. Without such a method, it is possible to miss out on partial payments or even bill a client for a service that has been paid. Checking these anomalies can be time-consuming and may negate the current template (if it doesn't use a chronological arrangement for unique invoice/payment numbers, instead of using "job names"). After loading Microsoft Excel, click "file" then "new" to open a "new workbook" dialog box. Scroll down the "Microsoft office online" and click "invoices" to locate a variety of templates you can use. Select a specific invoice template and click on "download" to display it in your excel file. Fill out the fields that require a custom entry, like company name, address and logo, payment terms and official payee name to receive check payments. Click "file" then "save." 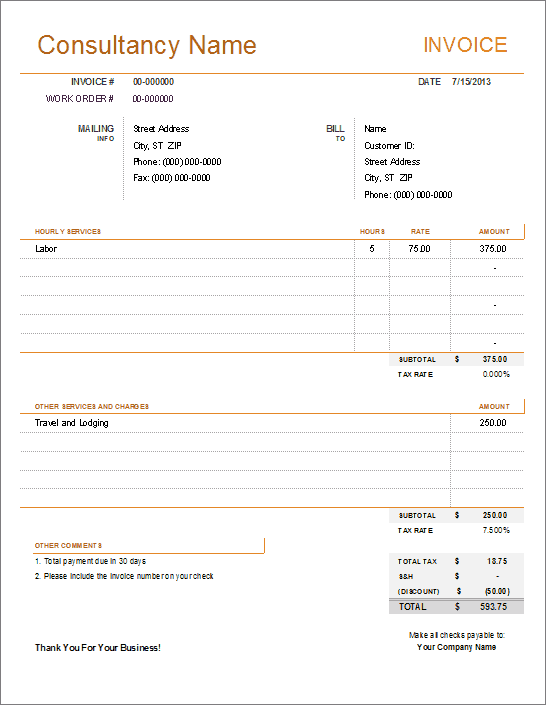 Thus you will have a new custom invoice template in a specific folder in your computer. You will then use this template, customizing it for different clients depending on the products and services offered during the consultancy contract.